In Biblical times shoes were made from animal skins which were difficult to clean. This may explain why shoes came to represent all that was unclean to the agricultural societies of the Old Testament. These emblems of filth were left outside homes and considered quite unsuitable for holy places. Feet encased in footwear required to be purified and this responsibility usually fell to the lowest house servant. Baring feet signified the status of an honored guest and washing feet put them at ease and comfort not to mention kept floors and bedding clean. Foot washing was viewed as an honor or service and became a common Jewish custom and at banquets. This took place either on arrival or before the feast. 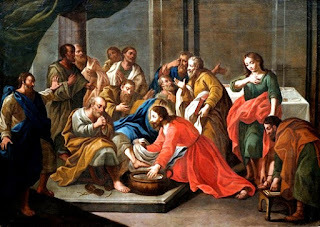 When anyone other than the lowest servant took to wash another's feet this was taken as an act of humility, a mark of respect or deliberate self-humiliation. In feet washing ceremonies marking the toe with blood or oil symbolized either consecration or the cleansing of the entire person. This ritual was considered important before priests could enter God's presence. The prospect of wealth was also described as bathing feet in oil. Mary Magdalane washed the feet of Christ with her tears and dried them with her hair, and anointed them with expensive ointment. For this token of devotion, Christ forgave her sins then proceeded to remind his host that he had not been extended the same courtesy as would be appropriate to a welcome guest.